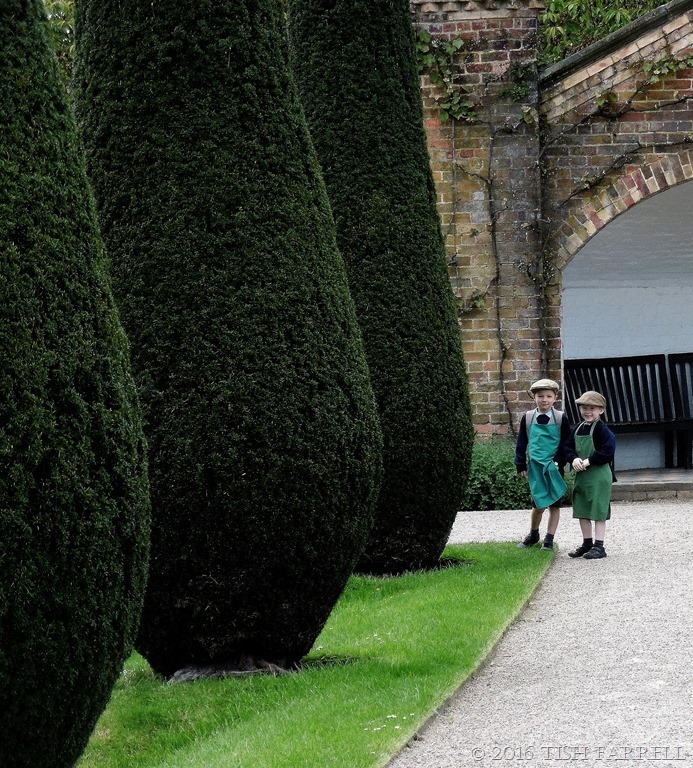 I was in the formal garden of Erddig stately home, thinking of photographing the avenue of shapely yews when these two young men walked into the frame. They lingered, clearly wanting to be photographed in their costumes as 1900s serving lads. Then the kitchen maids arrived to send them back to their duties, and they were gone. On the other hand I could have captured a time slip: a pair of fleeting Edwardian ghosts? 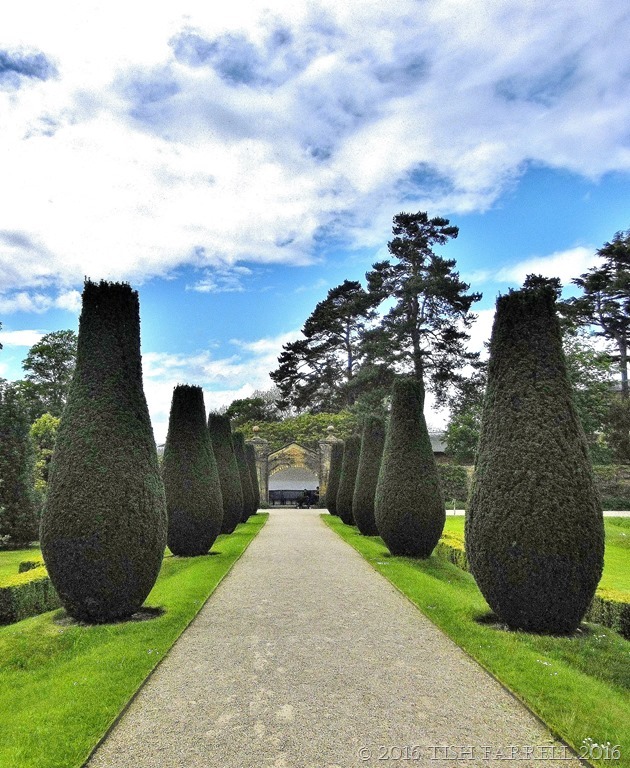 Now here’s the yew avenue I was aiming to snap. No one quite knows why they do it. Or they didn’t the last time I pursued the matter. 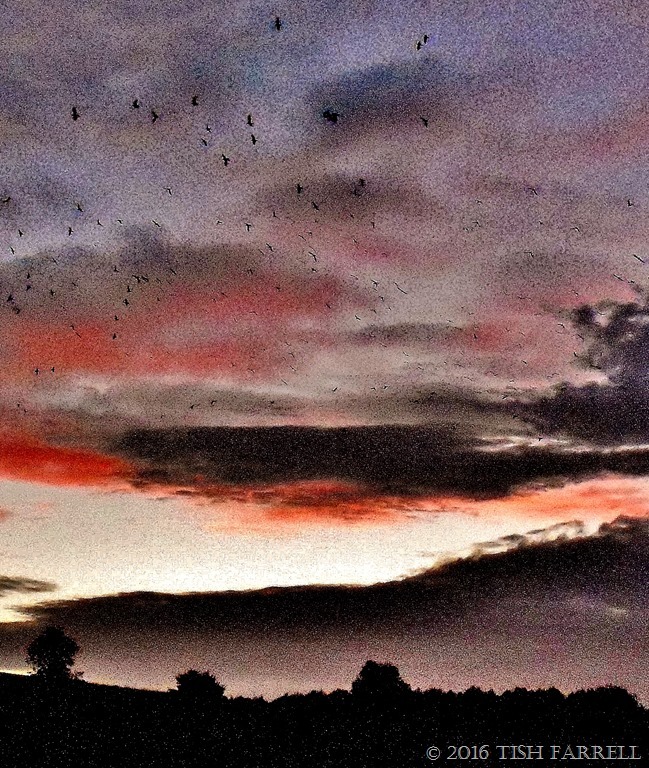 But as summer ends so the rooks begin their twilight dancing. There is a large rookery in the wood behind the house. Many scores of birds. Jackdaws live there too. Now each evening, as the sun slips behind Wenlock Edge we watch the rook and jackdaw ballet. Flock after flock flies in, flies out, sweeps up, round, back, spirals, dives in sequences so swift and coordinated that there must surely be some corvid dance-master somewhere orchestrating the moves. The show may last for many minutes, subside into the treetops, then burst out and start all over again. Finally, as the light goes, every bird finds its perch, and the wood subsides into companionable darkness and gentle rook chatter. This was where I was last Thursday morning – not posting on Thursday’s Special, but trying to find a good spot on a field path outside Hathersage so I could photograph Callow Farm. This was the place where four generations of my Fox family ancestors were tenant farmers from around 1700 to 1892. Before that, during the late 1600s, they rented another Duke of Devonshire farm, The Oaks, up on the wilder heights of Offerton Moor, not far from Callow. 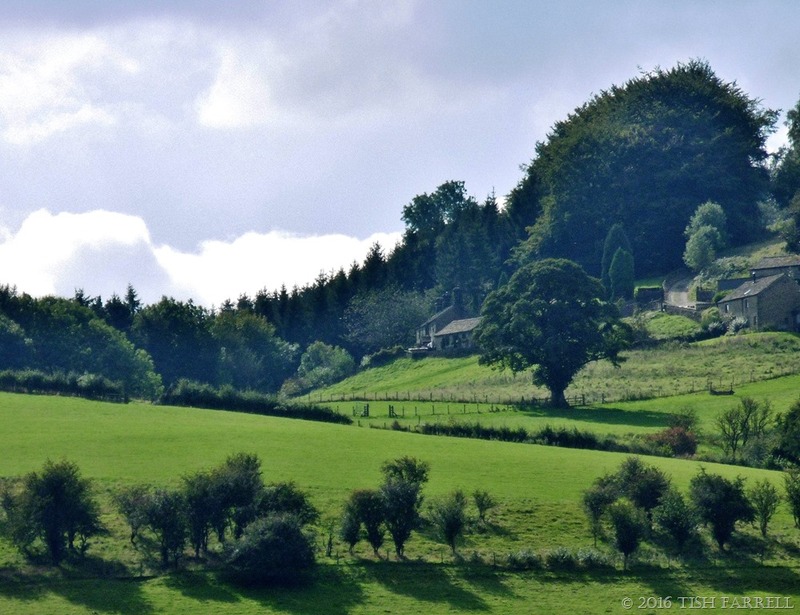 As you can see, the house (centre) is covertly situated, in the lee of the hill beside the wood. I had to use a lot of zoom, hence the hazy look, though such haziness is perhaps fitting for this piece of ancestral snooping. The more readily visible buildings on the right are the farm’s barns, now an upscale holiday let. 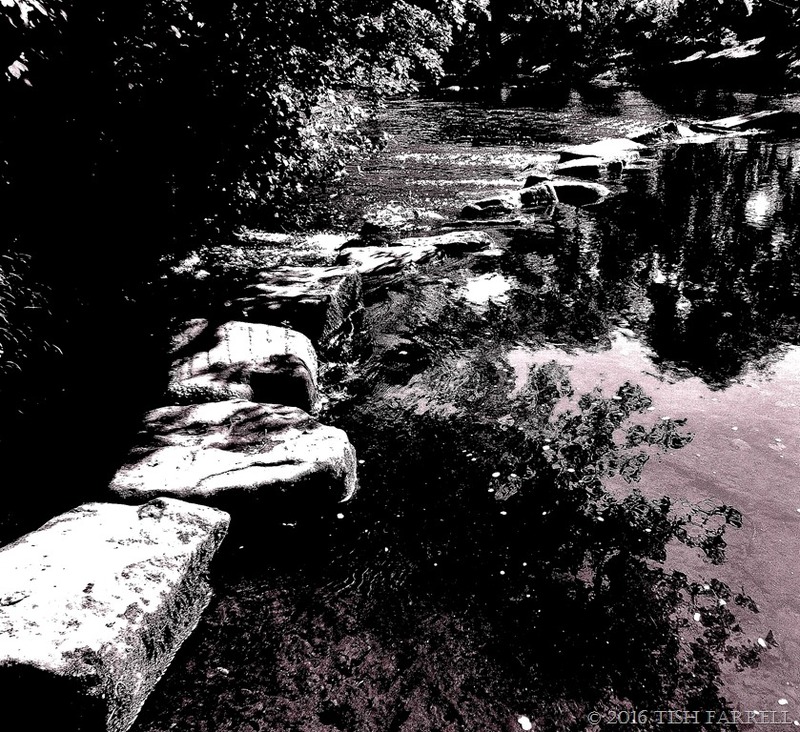 If you go to the previous post Stepping Stones Through Time you’ll find more of the story behind this photo. This was the reason why I had hoped to cross the stepping stones, to achieve a closer view than this one. Ah well. Maybe next time. There’s still time to take part in last week’s Thursday’s Special. Paula says ‘Pick a word in September’. Choose from: populated, time-sensitive, companionable, burgeoning, clandestine, but first go and see her gallery of photos and be inspired. 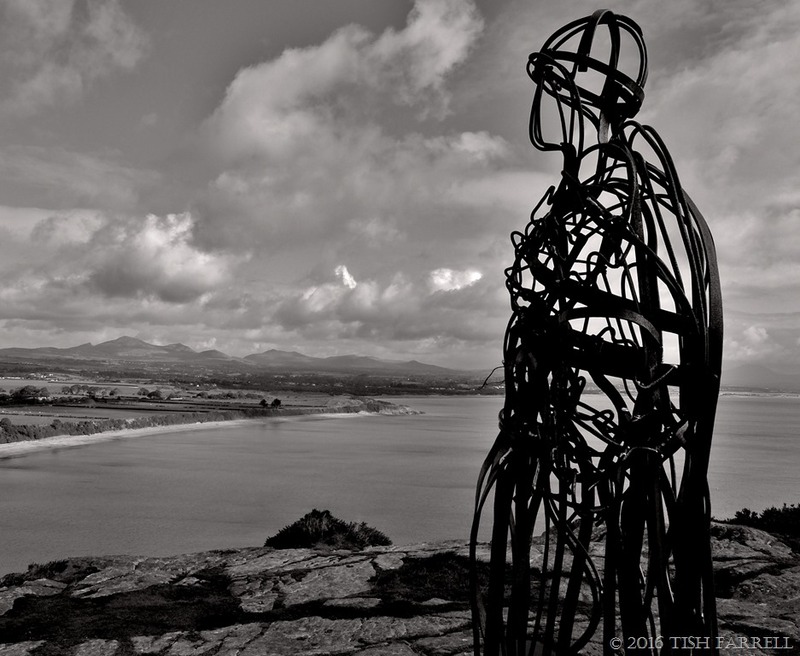 I’ve written about the Iron Man of Llanbedrog in other posts. (Personally I think it could be a woman – Boudica perhaps, the last of Britain’s Celtic warrior women). 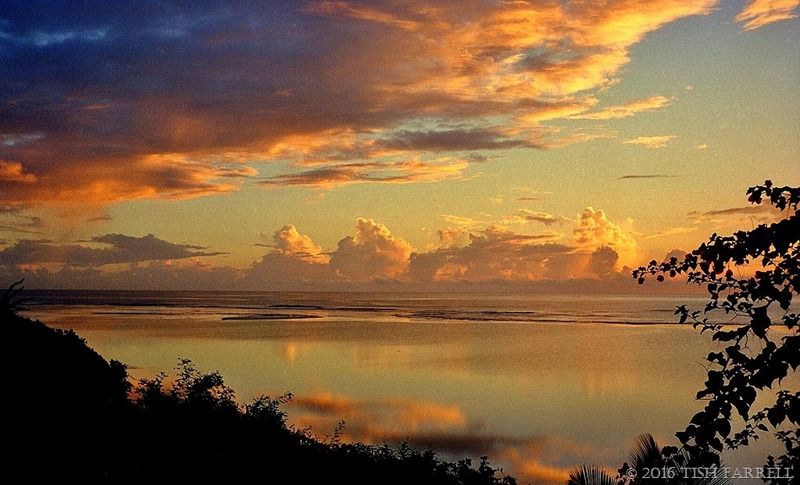 I’ve also posted variously edited versions of this shot before, but not this one exactly. 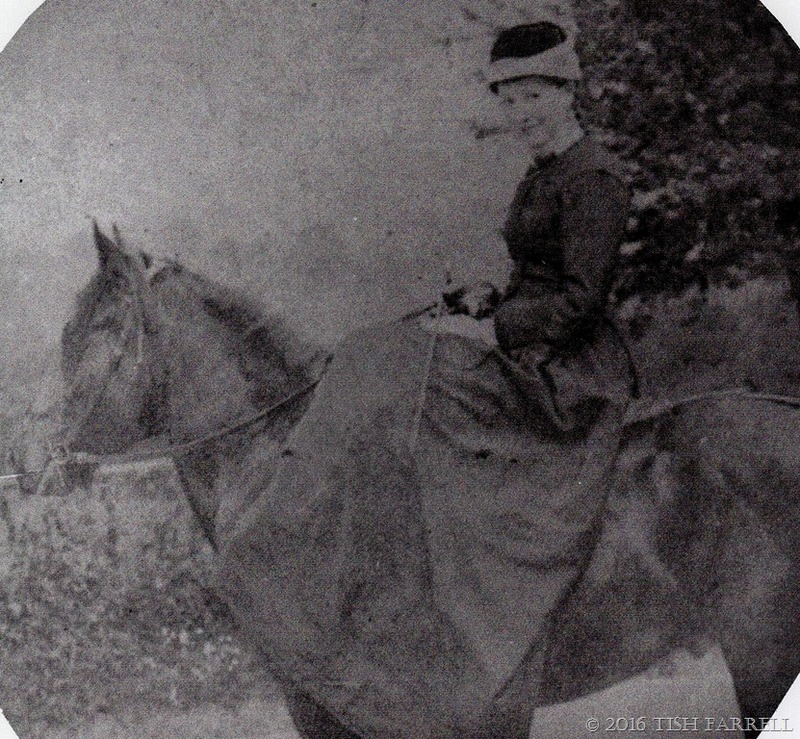 This week at Black & White Sunday, Paula is reprising the popular Traces of the Past challenge, and I thought that although this iron figure is not especially old, everything about it speaks of the ancient Celtic spirit. And of course there are the ‘rocks of ages’ just visible in the distant mountain range of Snowdonia. In many senses, then, Wales is an old, old land, and the traces of the past are everywhere across the landscape. Paula has truly set us a challenge this week: DECONSTRUCTION. 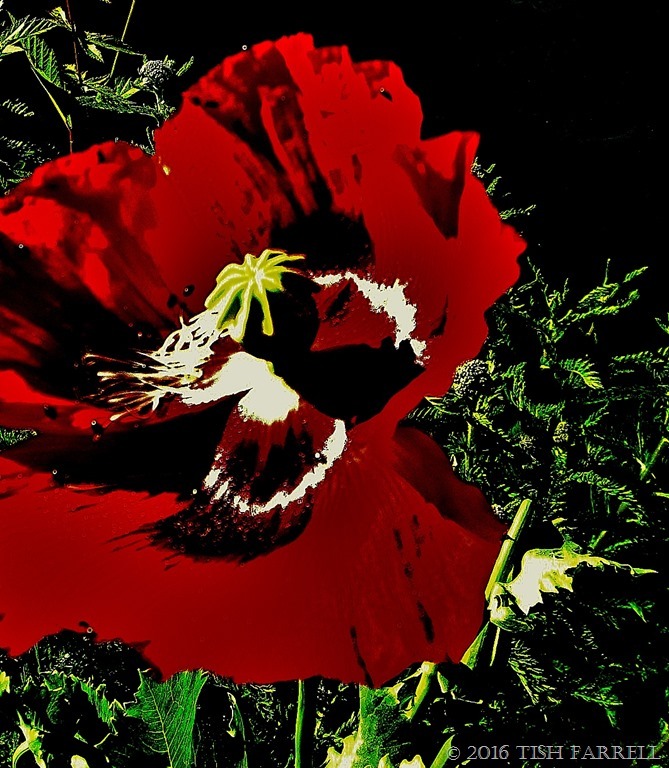 So as my stab at this school of philosophical thought, here is an abstracted opium poppy, its stamens and petals being blown off in the wind: caught in the act of deconstruction then: from flower to seed capsule. The cycle of life in all its parts. This photo was taken from the field path in Townsend Meadow behind our house, a scene captured one day last winter when I was late home from the allotment. 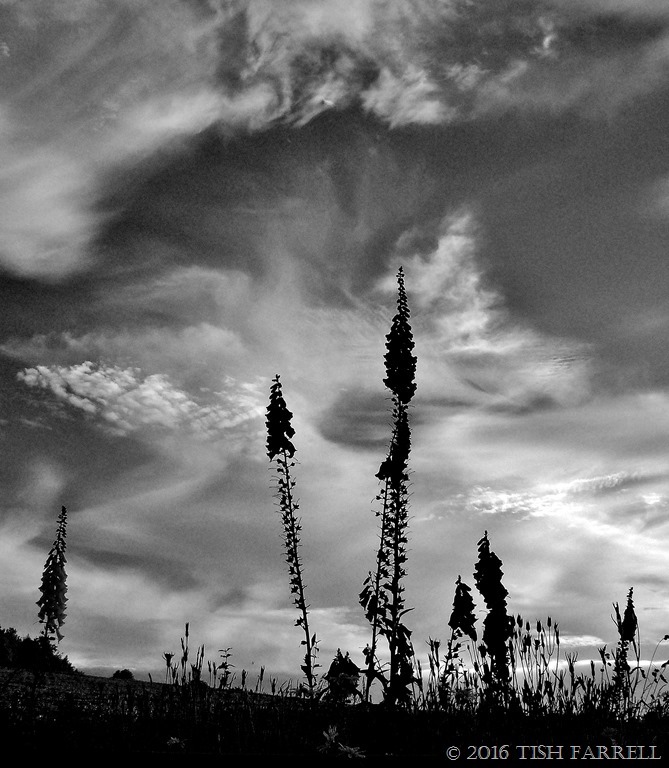 I often stop at this point on the path to take photos. 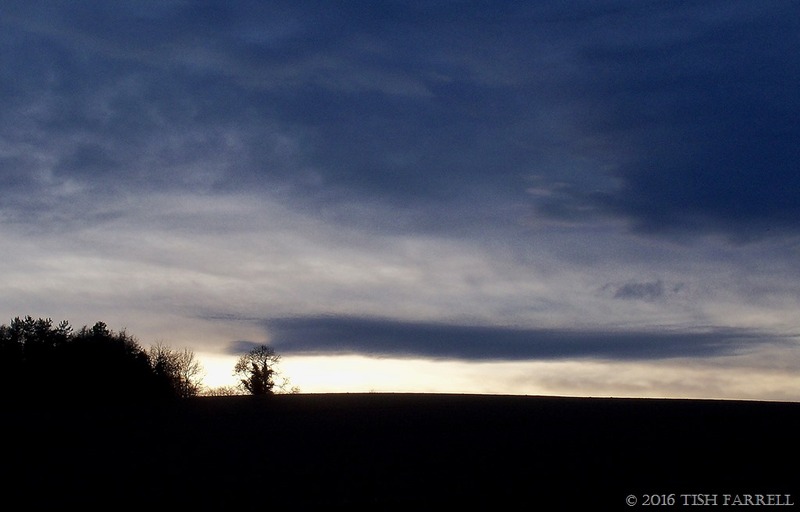 The ash tree silhouette always catches my eye, whatever the season, and I love the way the day seems to slip behind the hill as night shuts down on top and shadows creep up to meet it. It’s a bit like a stage set. Or it could be Rip Van Winkle Land. 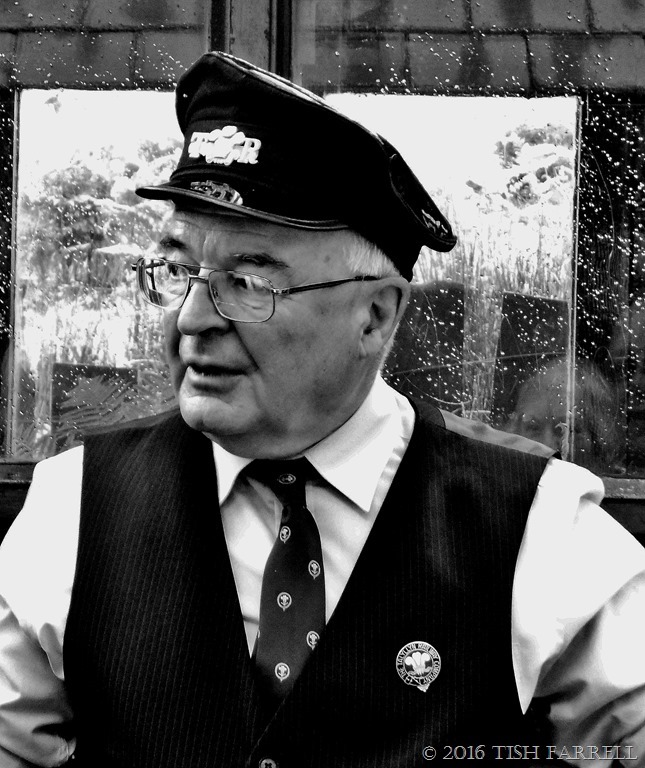 Here’s another portrait from our Victorian day out on the Talyllyn Railway in June. Looking at their website this morning I see they’ve got a very special trip coming up next month – The Halloween Steam and Scream. Oh what a hoot. I think I want to go. It’s my birthday too. There will be a choice of two Steam and Scream trains departing from Tywyn station at 5.15 and 7.15 on several October nights including the 31st. Everyone can dress up as ghouls, goblins and witches; there are prizes for the best carved pumpkin lantern, and you can book a feast at the railway cafe. Join us for a fun spooky evening train ride along the Talyllyn Railway to the haunted woods at Dolgoch, says the blurb. Those woods are pretty spooky in broad daylight, but on a dark autumn night in the Welsh hills…Watch out for the Hessian Horseman and his Celtic brother. Yikes! And double yikes! Now please visit Paula at Lost in Translation for more B & W Sunday portraits.